Hey all! Trying something new here. As I’ve mentioned before, I have a growing Nendoroid obsession and while that currently doesn’t extend to other figures at the moment, I still like see what’s out there so here’s a little recap of things that have caught my interest lately in a new, hopefully reoccurring, segment. Enjoy! Preorders for Nendoroid Lillie, from the hit game Pokémon Sun/Moon are open. She comes in her classic white dress with her matching sun hat plus her famous bag (get in the bag Nebby!) and of course Nebby the Cosmog. Isn’t she super cute? Thinking about grabbing one for myself! Speaking of ordering Nendoroids, I finally put my money down for Daichi from Haikyuu!! The captain of the Karasuno Volleyball Team is ready to join the rest of the team, flowing jacket and all! Another volleyball captain in Nendoroid form we got a sneak peek of recently: Ushijima Wakatoshi! Daichi isn’t the only Karasuno member with a figure out for preorder. Already released in Nendoroid form, Hinata is ready to shine in his figma glory! I just recently got into Love Live and so these figmas of Maki and Nozomi in cheerleading outfits are so cute! And they aren’t the only ones to get these figures either! Honoka, Eli, Kotori, Rin and Umi are all also available in their corresponding outfit. And that’s about it for figures news that made me fan girl recently. Aren’t they all great? So pretty…. Anywho. 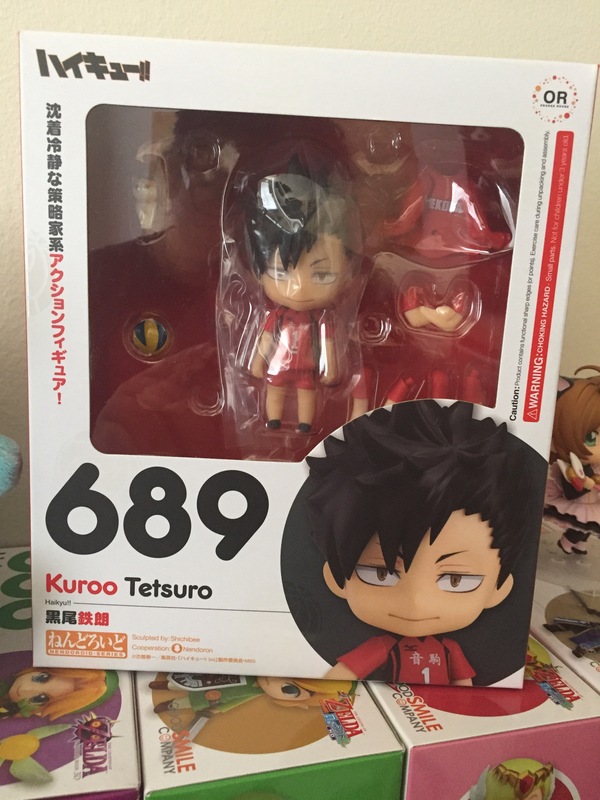 As for my own collection, a new member has arrived to join the team: Kuroo Tetsuro! Hopefully I’ll get to shoot an unboxing video for this little guy with my friends soon. You’ll be able to find that plus all our other Nendoroid unboxing videos on our YouTube channel, BabyCrowsCafe. So I (Pati) have decided to move to a new account (@a.small.geeky.chica) to continue posting all my nendoroid photography and any other future toy photography projects. @babycrowscafe was originally supposed to be a spot where my two friends and I could post anime-related stuff and ever since I started with nendophotography, I kind of took over. I want them to be able to freely post here so I decided to make my own dedicated instagram instead. I might still post some stuff here but if you want to keep following my nendophotos please check out my new account. Thanks!